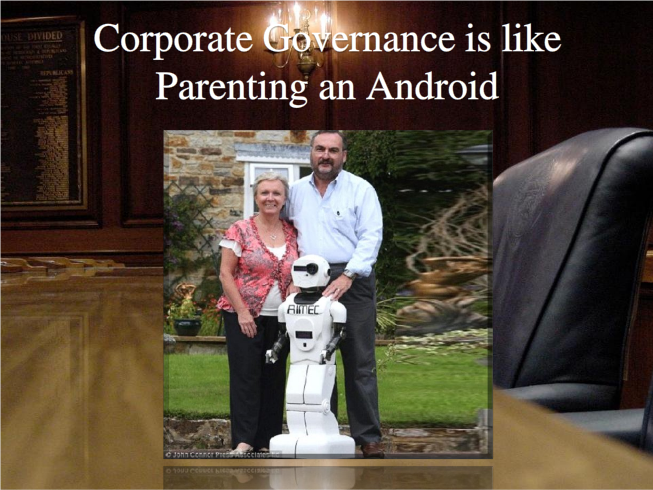 By Alex Todd Alex Todd - Founder at Trust Enablement Inc.
An alternative conceptual model for a corporate board as a parental archetype, and the firm as its android child. Costly, systemic power imbalances and conflicts of interest, inherent in the conventional model, are resolved by applying ancient Roman property law principles (usus, fructus, and abusus). Corporate governance is a complex subject. It has been defined in many different ways, and has been the subject of countless debates about its purpose, roles, and responsibilities. Corporate directors’ legal obligations vary across jurisdictions, and opinions about corporate governance best practices, their value, and the means by which to adopt them are conflicting. Overwhelmed by the myriad factors that shape our understanding of corporate governance, it is not surprising that the state of corporate governance worldwide is in a state of crisis and is subject to unprecedented scrutiny. Reactive regulations that restrict corporate conduct in response to a series of corporate scandals and financial crisis have opened a space for massive reform. The accelerating downward spiral of systemic failures and regulatory plugs, combined with the emergence of powerful competitive forces, has put western-style capitalism at a crossroads. The soul-searching dialogue to improve understanding and redefine the desired future of corporate governance is already underway. Now, even conventional wisdom and the most cherished beliefs are on the table and open for discussion. However, what is now accepted as “good” corporate governance, if left uncontested, will keep capitalism on its current, unsustainable trajectory. Left uncorrected, marginalized anti-capitalist forces will gain power and momentum, threatening to swing the economic pendulum to its opposite extreme. By definition, neither extreme is sustainable and both are undesirable. Choices that consider the full complexity of the business environment need to be guided by principles and frameworks that promote adoption of balanced approaches for addressing ever-changing demands on corporate governance. Complex concepts and interactions are difficult to describe and comprehend. Often metaphors and conceptual analogies can be useful techniques for relating what is known and familiar to things that may be difficult to grasp. A conceptual model is valid when it provides a context that reliably infers meanings to occurrences and helps clarify uncertain cause and effect dynamics. It is difficult, if not impossible, to reach consensus about a complex subject when people’s perspectives are rooted in incompatible conceptual models. It would therefore be misguided to attempt a diagnosis or design of corporate governance systems by relying on incompatible views about its fundamental nature. Although desirable, it may be equally unrealistic to expect everyone to hold the same world view of corporate governance as it is for everyone to share the same political values or religious beliefs. Nevertheless, an explicit expression of one’s concept of corporate governance would be beneficial for gaining insights into how to evolve corporate laws, corporate governance systems, and board practices. Many corporate directors see themselves as representing shareholder interests in monitoring the activities of management, analogous to a watchdog delegate. Other directors see themselves as independent guardians of the integrity of the capitalist system, analogous to judges ruling on management conduct. Yet others may identify with being a sounding board for management, akin to a mentor. Most would likely feel uncomfortable choosing any one archetype. Instead, they might prefer to provide a description of their primary roles and responsibilities as corporate directors. The challenge with picking just one archetype is that it may not fit all corporate forms (private, listed, non-profit, etc.) and situations, or it may not fully encompass the director’s conceptual model of corporate governance. However, this is problematic, because it allows for inconsistencies and contradictions to infect any viable unifying conceptual model of corporate governance. Consider the possibility that the purpose and role every corporate board, of any corporate form, in any situation, best fits a parental archetype[i]. A parent’s overriding objectives are to develop their child into a productive and valued member of society. It is a complex role, because success depends on many factors both within and outside the parent’s control (genetics, family, friends, external influences, etc. ), and there is generally not a direct cause-effect relationship between what parents do and how the child responds. After giving birth to their child, parents create supportive conditions for the child’s development, protection, and self-determination. These characteristics are strikingly similar to the role of a corporate board. Similarly, the legal relationship between the parent and the child is essentially the same as the fiduciary duty the board has to the corporation. Consider also the possibility that the corporation, a legal person in law, is an incomplete person, analogous to an android[ii]. A corporation exists as a member of society, but does not have the same human needs as natural members of society. For that reason, corporations need to be socialized to fit in with society and function as productive and valued participants. Left to their own devices, despite being comprised of individuals engaged in a common enterprise, corporations are distinct entities that do not have the same needs or sensibilities as the people with whom they interact and whose lives they affect. As such, they need a systemic human connection that assures their productive integration into society. That responsibility resides squarely with the board of directors. Hence, the overriding purpose of corporate governance may well be to productively integrate corporations into society. Although these analogies might sound reasonable in theory, closer scrutiny reveals significant incongruence with experience. Most notably, for-profit corporations are considered to be the property of their shareholders. Unfortunately, this contradicts the principle that people are not property. It can therefore be argued that ownership of legal persons is analogous to slavery, which is illegal. Any universal view of corporate governance would have to be equally valid for all corporate forms, including non-profit corporations that do not have owners, but instead have members who serve as their principles (effective owners). The conventional view of the corporation as property considers non-profits to be a special case, and therefore invalidate its universality. Another way to look at the ownership dilemma is from a property rights perspective. Ownership of shares, does not carry the same rights as title to real property, such as a plot of land[iii]. Shares are an abstract legal instrument that conveys specific rights and obligations to shareholders, but does not pass on a title to the corporation. It is therefore invalid to infer that stock ownership is the same as company ownership. Shareholders are not company owners. And since we know that members of not-profit companies are also not company owners, who is - if anyone? This is where conventional wisdom breaks down. Nobody owns a corporation, not even founding entrepreneurs. A corporation is a legal person, and it is illegal to own people. This clearly suggests a materially different conceptual model of the corporations in the western capitalist system, which is founded on inexorable principles of property ownership. If corporations are not owned, but contracted, then what could be legitimate claims of shareholders and other stakeholders? Under contract law, they are only entitled to what is contracted and mandated by law. Shareowners have no innate claim to the property of a solvent corporation. Although, shareholders typically have a right to sell their shares, vote for corporate directors and certain other matters, and claim the residual value of the corporation[iv], only equity participation is inherent to the concept of an equity share. All other rights and obligations are contracted between the issuer (the corporation) and its shareholders. It is therefore not inconceivable that a corporation could choose to issue non-voting equity shares, transfer-restricted capital stock, and/or even non-equity voting rights (as with members of non-profit corporations) to satisfy various corporate governance objectives. If shareholders are only contractually entitled to equity participation, without ownership rights, to whom should corporate boards be accountable? After all, even if one were to accept the possibility that the overriding purpose of corporate governance is to ensure corporations are productive members of society, then who in society should control the board? Few would disagree that shareholders who have contributed capital to the business, capital stockowners whose capital is at risk of uncertain returns, are entitle to a voice on how the corporation is governed. But should shareholders who purchased their shares from other shareholders, rather than the issuer, be entitled to the same rights? The relationships of the capital stockowner and the market shareholder to the issuer are clearly not equivalent, and it would not be unreasonable for them to be entitled to distinct shareholder rights[v]. Subordinated rights of one class of shareholders that expose these shareholders, without remedy, to oppression by a majority equity holder (analogous to dual class share structures, whereby one class enjoys disproportionate voting rights relative to the equity value of the shares they hold) is generally undesirable. However, if the relative powers of the classified shareholders were distributed equitably, such meritocratic (distinct from democratic) share structures could be made acceptable. Ancient Roman principles of property rights were designed to prevent oppression by any one property reliant party over another by balancing property rights between all property stakeholders. No property stakeholder, whether landlord or tenant, was allowed to hold all three rights of fructus, abusus, and usus; namely the right to the yield from the land, the sale of the land, and to work the land. Landowners had the right to abusus (sell) and a portion of fructus (yield), but not usus (forbidden to work the land). The tenant had the right to part of the fructus and to usus, but not to abusus. In the feudal system, no individual, not even the king, was allowed to own all three property rights[vi]. Consider the property rights enjoyed by today’s shareholders. They enjoy all three rights; a portion of fructus in the form a residual share of the equity, abusus with a right to sell their shares, and usus with voting rights. Based on ancient Roman principles of property ownership, today’s shareholders have disproportionate power over issuers and other corporate stakeholders. Applying Roman property law principles to today’s capital markets may seem like a step back rather than progress, but what if it were to offer a simple solution to many of the problems plaguing modern capitalism? Suppose that capital stockowners had the right to part of the residual equity of the firm (fructus) and the right to vote for corporate directors and other matters (usus), but were restricted from selling their shares on public markets (abusus). This has historically been the customary practice of family-owned businesses, as they preferred to not exercise their right to sell (abusus) in order to keep the business in the family. Suppose, also that all other shareholders retained their right to an equal proportion of the gains (fructus) and exclusivity to sell (abusus), but their right to vote (usus) were restricted or rescinded. This could potentially eliminate the problem of shareholder oppression by removing the incentive of capital stockowners to expropriate capital resources from other non-voting shareowners. It would also systematize long-term stockownership by contributors of capital (and specified opt-in shareholders), analogous to today’s buy-and-hold, long-term shareholders. This approach potentially offers an added benefit of unraveling the snarl of regulations that attempt to align management interests with shareholders. By also replacing shares given to management with a class that restricts selling (abusus), same as capital stockowners, management interests would inevitably become better aligned with voting stockowners, and would remove a major incentive for them to “play the expectations game”[vii] of stock price timing and manipulation. Corporate directors, together with other strategic stakeholders, could receive transferrable (abusus), non-equity voting (usus) shares. This would give society a direct voice in corporate governance, rather than being relegated to proxy voting of equity shares. A derivative benefit would be the cost savings associated with stockowners not having to vote on every issue, thereby largely eliminating the plethora of current incarnations of internal and external proxy voting resources. Instead, voting considerations by capital stockholders would largely be oriented toward considerations that affect long-term financial performance of the business. Voting by other stakeholders (possibly including trading shareholders) could be conducted via stakeholder councils elected to represent the interests of the firm’s strategic stakeholders. As a result, relatively few proxy votes would need to be counted. "Educate corporate directors, investors and regulators." Could you elaborate a bit more on how this would inspire and motivate leaders to learn and attempt more of the change you advocate? Motivating people to make choices in favour of aspirational change, at the expense of pragmatic considerations, is a universally herculian challenge. Fortunately, my proposal is both aspirational and pragmatic. Modifying sharholder rights requires only a change to coprorate by-laws, not regulatory reforms. Such change would be most challenging where shares are already widely held and/or of interest to activist investors. Similarly, venture capitalists seeking stock liquidity would likely also resist investing in trade-restricted stocks. In fact, the bulk of the investment industry, as well as many executives compensated with company stock, would find it difficult to make a tradeoff between their vested interests and aspirational considerations. However, a minority of investors who value control over liquidity would place a higher value on the trade restricted shares. It would be interesting to observe the relative valuations of the two classes of stock throughout the lifecycle of a company. I believe owners of private companies who seek public capital and wish to retain control of the company would be most interested in learning about this approach (i.e. many recent technology IPOs are structured to preserve founder control). Index investors and large pensions funds who are unwilling or unable to sell their shares may also be interested in learning about how to exert more influece over corporate boards, especially those that are already actively influencing board practices.